What a great thing to do and what a great decal. Hopefully the donation will help someone. OOh Sorry KYLa…. not Kayla…. fingers are stiff and cold here on the hill today. 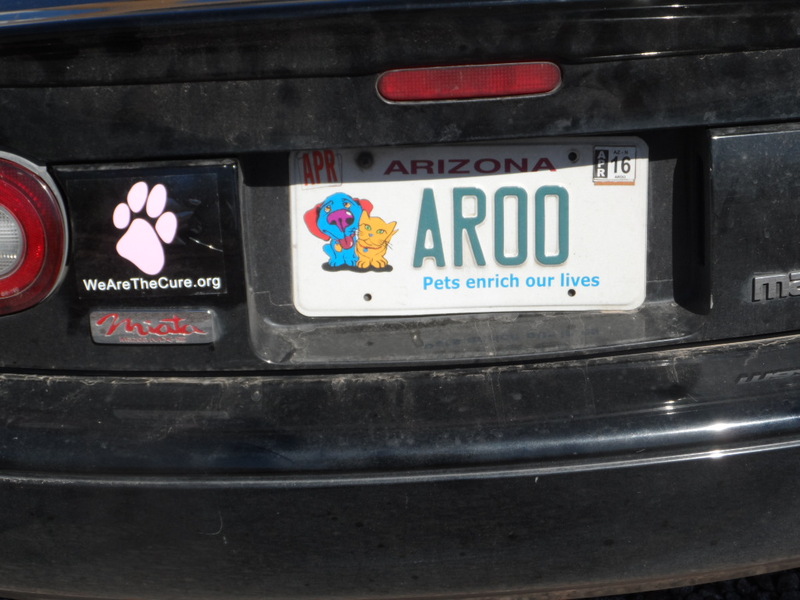 Now that is an awesome license plate! You hadn’t seen that before? The perfect place. Aarroooo, to you! I hope nobody rear ends the Scottiemobile while trying to read it. Aw man! How cool is that????? She’d love that. AROOOOO! Yes, she would. He was considering renaming the vehicle, the KylaMobile but then He’d have to get a new front plate. Two fantastic ways to honor Kyla. We love it. Not a day goes by that we don’t think of her. This house also. Kyla would have loved your new guy, Riley. Pawfect place to put it. Put it out there so peeps can read it, I say! I think Kyla would approve and be saying you knock that canine cancer down and run it into the ground. Hopefully they get some sort of handle on it before SWTS gets it. Been there done that with my last two Scots. Unfortunately, Scots are prone to it. We’re careful about what we use on weeds (we have over an acre). The next door neighbors on the west (where the prevailing winds come from) aren’t animal people. I think they spray their yard with the herbicide 2-4-D which is a carcinogen, in dogs (and peeps also, I think) and Scots are more prone to it than your average canine. 2-4-D is illegal to use in California because of the carcinogenic propensities. Can you believe that it’s the actual state issued plate? Well, if it can’t be on Kismet’s beak, that’s the second best location. Hahahaha…just kidding, bird friend. Pawsome! There are times when the peeps threaten to use duck tape to shut me up. That is lovely. Kyla was a wonderful Scott. Pawsome we say. Have a wonderful Wednesday. It beats the bottom of my bird cage. it’s a perfect addition and I hope so much that once we will have a cure to show this evil big C the middle finger. The peeps show it that, but C doesn’t care. It is a great reminder every time that you use the Scottie mobile. We look at Kyla everyday with our plate. It’s more of an attempt to get others involved. The ScottieMobile is in the shop. It has over 170K miles on it but it’s worthy of a terrier. Kyla would be so proud. I wish she were here to tell us to our face.Such will never be the case, but we wish that it would help at least one member of Blogville.